Hey guys! Only a week behind with March’s budget update. Trust me, one week behind isn’t too bad for me right now. heh. Work is a bit in overdrive, but I love it. I’m gearing up, getting ready to be out of town for a solid 8 day cruise and working like a crazy person to try to get everything set just right to run on auto-pilot (fingers crossed) while I’m gone. Down Payment Savings ($2000): This is right on track.” The goal is to get to $10,000 by summer time. I’ve had a couple questions about the house-hunting journey. We have NOT started “hunting” yet (though we’ve been doing searches on Zillow just-for-fun and grabbing flyers from homes that are for sale just for comparison). With everything going on, we decided to wait until after the cruise to start hiring people (e.g., realtor, mortgage lender). Our goal is to move late summer or possibly early fall. Our current lease is up at the end of August but our landlord will let us go month-to-month at our current rate (no increase) if we haven’t closed yet by that time. The ideal situation would be to close in late August so there’s just a little overlap of about a week or so. But I know these things can be so unpredictable and we’re lucky to have flexibility with our current landlord. We do NOT, however, want to move much earlier than August (since we’d then be paying double rent/mortgage). So we are not actively on the house-hunt yet. Electricity ($176): Remember our outrageous electric bill from February? Fortunately, we only got caught by surprise that one month. Since then, the A/C and heater have both been turned OFF. There have been some hot days (and some cold nights), but it’s been within a range that we as a family could deal with (nothing too extreme). It’s been in the mid-90*s a couple times this week already, so we’ll see how long we can go without any A/C. I already got the bill for April and it’s UNDER $100!!! I’m loving the lower electric bills right now but, like I said…we’ll see how long this lasts (Tucson’s summers are brutal!) The A/C will have to go on at some point. Gift-Giving ($189): Similar to last month, almost all of this was a charitable donation I made so we could max out Arizona’s tax credit. $25 was for a wedding gift, which was the only non-donation portion of the gift-giving. Entertainment ($102): A few bucks of this was for music on itunes. The rest was from a date night. As promised, hubs and I are planning to do about one date per month this year (in the past 2 years we rarely ever had date nights). So expect this category to be a bit higher this year in compared to previous years. Kids’ Activities ($142): This was a high-spending month for kids’ activities. The bulk of this was from our weekly swim lessons (April is the last month for our lessons; we may re-start once it’s summer time, but the initial point of the swim was to get the kids comfortable around water before our cruise. They’ve been making great strides with safety and although they aren’t fully able to swim, of course, they have learned all kinds of life-saving measures if they were to fall in. Safety was my main concern). $40 of this was from horseback riding lessons and farm time that we did while the girls were on Spring Break. The person who does it is a friend-of-a-friend. She is the Benson Butterfield Rodeo Queen. She lives on a nearby farm and lets kids come out and experience “farm time” (basically feeding and petting/playing with all the animals) for $15/hour and horseback riding lessons for $20/hour. I split the lesson so each child had 30 minutes of instruction and tipped an extra $5 just because she was extremely accommodating. Still kind of spendy for us, but it was a ton of fun and was a great way to spend a couple hours during Spring Break week. Groceries ($573): After months and months of struggling to keep this number below $600, we finally pulled it off this month. I think it helped that I had increased flexibility over Spring Break (so I was at the house, able to do more food prep, etc.). I’ve also been making a really conscious effort to prep foods on Sunday for the week to come. I’ve gone so far as to portion out daily portions of fruits and snacks; I’ve pre-cooked chicken breasts for lunches; I’ve pre-washed, peeled and chopped up carrots into sticks for snacks; I’ve pre-made breakfasts (e.g., like making a big batch of pancakes that can be refrigerated/frozen and re-heated in a toaster), etc. etc. etc. It’s tedious and time consuming and not always the way I want to spend my Sunday afternoons (I typically do everything while the girls nap), but it’s made my life MUCH easier during the week when I do my prep versus when I don’t. Household Goods ($144): This category is pretty high this month because I spent $100 on stuff for my office. I bought a 5 x 7 rug, a big wall clock, and a painting (all from Big Lots). I started this job last July, but it just now looks like I’ve actually moved into my office space. It’s really nice, especially since I spend a lot of time there. 3-6 Month EF: $1,000 (goal is to get to $5,000). Birthdays: $200. The girls’ birthday is on the horizon in June. To date, we’ve never had an actual birthday party for them, but we want to this year for the first time. It will still be simple (at our house, not another venue), but we’re going to start throwing a couple hundred a month toward this savings category so we don’t get caught by surprise in June. Travel/Christmas $50. We like to save at least $50/month in this category, as finances allow (sometimes we skip it if needed). Savings for 2015 Roth IRA: $300 deposited. Another note about this is listed below. Cruise 2016: $500. I also withdrew $35 from my cruise fund to buy some new clothes for the trip. Debt: I gave a full debt update here. 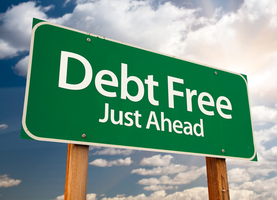 We ended up putting more toward debt this month than we’d originally thought we would because the balance transfer really needed to be paid off before April (and we did manage to make that happen). It all worked out, though, because we still hit our goal of $2,000 toward the house down payment fund, and we still started hitting several of our other savings goals. We’ll continue to beef up our emergency fund, specifically, in addition to our other “rainy day savings” funds in the months to come. Related to savings, I didn’t report the “withdrawal” above because it technically occurred in early April, but I took $1500 out of the “savings for 2015 Roth IRA” and put it into our Roth account (last year was the first year we opened a Roth, with a meager $1300 contribution). Our contribution this year wasn’t great either, but it’s better than nothing and 10% of my paycheck is auto-deducted and invested into a 401(k), so this is actually a little deceiving because we certainly saved more than just $1500 this year. So there you have it. The big goal remains the same: Save up money for a downpayment for a house, beef up our emergency fund, and continue knocking those student loans in the face. It’s more like little jabs right now while we’re saving so much. But soon it will be full-blown punches! I’m coming for you, student loans! Mwhahaha (<evil debt-paying laugh).